Within the undergraduate BSE program, there are two different classifications that identify a student’s level in the program: PAE and ABE. Students with a PAE classification are referred as to Pre-Biological Systems Engineers. A more detailed description of student classification can be found in the Undergraduate Student Handbook. In order to graduate and receive a degree, you must achieve the ABE classification, which is given once a student has met the minimum requirements, listed under “ABE Requirements” below. When you enter our program as a freshman, you are given a PAE classification. Entry into the program as a freshman is controlled by the UW-Madison Office of Admissions and Recruitment; the BSE Department is not involved in, nor does it have any control over this process. When planning courses for enrollment and four year plans, it’s helpful to remember that four years is plenty of time to complete a BSE degree. The recommended course load is between 15 and 17 credits, as this leaves room for retaking classes should the need arise. A freshman’s primary goals should be to do well in the introductory science classes and achieve ABE classification as soon as possible. Because the BSE program is the only accredited biological engineering program in Wisconsin, many students transfer into our program after beginning their studies elsewhere. Students transfer into the BSE program as pre-biological systems engineering students (PAE) or as ABE students. There are no minimum requirements to transfer in as a PAE student. To transfer in as an ABE student, you must meet all requirements for admission to the degree granting program. Students at other UW System institutions planning to transfer to UW-Madison to obtain a BSE degree should work with the UW-Madison BSE Department to ensure that the courses they are taking will meet BSE degree requirements. If possible, such students should be enrolled in the Connections Program, which offers select Wisconsin residents the opportunity to start at one of 21 partner institutions and finish their bachelor’s degree at UW-Madison—and hold a distinctive UW-Madison student status from the beginning. In other words, students are essentially simultaneously enrolled at both institutions. This means that students can lock into an official UW-Madison BSE curriculum at the time they start their studies at another institution. The curriculum for the BSE major is updated on an annual or biennial basis. Students who plan on obtaining a BSE degree, but begin working on BSE degree requirements prior to officially transferring into the program should be aware of this since they will be required to meet the requirements of the curriculum in effect on the date of their official transfer into the program. Once enrolled in the program, they may (like all other enrolled students) elect to use a more newer curriculum, but then must complete all requirements of the newer curriculum. A minimum of 24 degree credits. A minimum of 17 credits of calculus, statistics, chemistry, computer science, statics, biology, and physics courses required for a BSE degree. A BSE Math and Science Grade Point Average (M&SGPA) of at least 2.80 with a minimum grade of C in every course used to calculate the M&SGPA (See below for more information on the M&SGPA). Must successfully complete introductory chemistry (CHEM 103 and CHEM 104, or CHEM 109, or equivalent) and math through MATH 222. As soon as you have simultaneously met the requirements, you are guaranteed ABE classification. However, this change does not become official until your academic advisor has filed a form with the CALS Office. It is a student’s responsibility to notify their advisor to complete this form. The preceding requirements for “degree granting” status differ from those for engineering departments in the College of Engineering in that BSE students are allowed to retake as many courses as needed to meet the requirements for ABE classification. Also, there is no time limit for students who join the department as freshmen as to when this requirement must be met, however, ABE classification is required for enrollment access to most upper-level BSE classes, listed below. You must have a grade of C or better in any course that has been completed and is included in the M&SGPA calculation list. For any course that a student repeats, only the most recent grade will be used in the calculation. Any transfer course from another university that is included in the course list must be included in the GPA calculation. There is no limit on the number of courses a student can retake or on the number of times a student can retake a specific course. Condition 3 is very important in that some students from outside the university are able to meet all conditions for ABE classification prior to transferring to UW-Madison. This also allows students who are currently enrolled in the UW-Madison BSE program to take (or retake) math and science courses at other institutions while they are working toward their BSE degree. When planning your classes and long-term plans, it’s important to realize that many courses are only offered once a year. This is currently true of all BSE lecture courses except BSE 367, which is offered both fall and spring semesters. *Taught every other year in the fall, odd years only (2015, 2017, etc.). 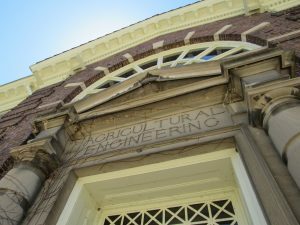 BSE 365, 461, 475, 476, 508, and 509, some Food Science courses, and many upper level College of Engineering courses require that a student be classified ABE. This is done to insure that the student has the basic math and science knowledge required to successfully complete the courses. For this reason, one of the primary goals of a student with a PAE classification should be to achieve ABE classification in a timely manner. BSE 508, Biological Systems Engineering Design Practicum I and BSE 509, Biological Systems Engineering Design Practicum II collectively comprise the program’s capstone design experience. BSE 509 is to be taken by students during their last fall semester of enrollment (and not before), with BSE 508 taken the previous spring. Students are assigned to a project and design team during BSE 508, and complete work on the project during BSE 509. In order to receive a final grade in BSE 509, a student must also have taken the Fundamentals of Engineering (FE) exam. The fixed sequence and timing of BSE 508 and BSE 509 mean that they will occasionally conflict with a student’s study abroad or internship experience. In such cases, provisions can be made to take the conflicting course remotely while abroad and/or interning off campus. Although all students must take BSE 508, a student can opt out of BSE 509 by completing a design project independent of BSE 509. To get the BSE 509 requirement formally waived, a student must submit (for review by faculty affiliated with BSE 509) a final written design project report and a design notebook (in paper or electronic form). The student is also required to present their design via a poster presentation and/or oral presentation, and they must have taken the FE exam. This policy is in place to encourage creative students to participate in on and off-campus design competitions that do not allow entry of classroom projects. It is important to note that students not receive degree credits for BSE 509 when it is waived in this manner. Students who transfer into the BSE program have often taken one or more courses prior to transfer that are similar, but do not carry the same course number(s) as the listed BSE curricular requirement. This is frequently the case with statistics and physics courses. With respect to statistics, the BSE Department will generally approve as a substitution for STAT 224 or STAT 324, any AP statistics (with respect to UW policy) or college level statistics course of three or more credits. This substitution recognizes the fact that on the UW-Madison campus, a student can generally not receive degree credit for more than one introductory statistics course (i.e., a student can only receive credit one of the following courses: STAT 201, 224, 301, 324, and 371). If you have questions about course substitution, you should contact your academic advisor. Detailed information about BSE’s undergraduate degree requirements can be found in our Undergraduate Student Handbook. Further information can also be found at the Undergraduate Guide, and the BSE Course Guide can be used to find our courses. The checklists below can be used to track your progress in the BSE major. In addition to completing the required courses, students must maintain a 2.0 GPA overall or better to remain in the program, have at least a 2.0 GPA for both the last and combined last two semesters in attendance, and must have a 2.0 GPA or better for all courses designated as BSE. Each student must complete the Fundamentals of Engineering Exam in order to receive a grade in BSE 509, although students are not required to pass the exam. The Fundamentals of Engineering Exam is a national exam, and it is to your advantage to take this exam as it is a precursor for the Professional Engineering (PE) Examination, which can be taken after gaining the prerequisite amount of professional work experience. In some areas it is essential to have a PE license.